Students of the Special Needs School at Vryman’s Erven, New Amsterdam will be in a better position to absorb their education and enhance their talents following the donation of over $2M in playground equipment and educational tools including books by the Gail Foundation. The Gail Foundation- (Giving Abundantly In Life-G.A.I.L Incorporated), which is founded and headed by overseas based Guyanese Attorney at law Gail Seeram, is a charitable organization based in Florida that does charity work in Guyana and other parts of the world. 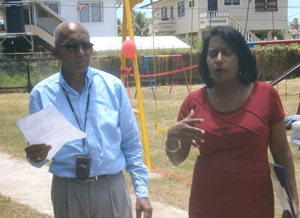 Mrs. Yvonne Hinds and donor Gail Seeram cut the ribbon to officially open the play ground. Among the package donated to the school were swings and slides for the playground, and a television set, projector, books, toys and other educational tools for the Therapy Room of the school. The occasion was blessed with the presence of Mrs. Yvonne Hinds, wife of Prime Minister Samuel Hinds. Mrs. Hinds expressed her delight in being a part of the special occasion. She related her relationship with Gail Seeram, her family and the Gail Foundation and lauded the work of the charitable organization. She stated that the work of the GAIL Foundation is a reminder that Guyanese are willing to support projects in Guyana. In her speech, Founder and Head of the GAIL Foundation, Mrs. Gail Seeram, stated that her initial intention was to build a playground for the students to have recreation, but after visiting the school and taking a tour of the facilities, she was unimpressed with what she saw. She stated that in addition to acquiring the materials to build the playground she also decided to fund the cost of the Therapy Room. She mentioned that children must have place and room to play and expressed themselves, especially children who are challenged. Also speaking at the simple ceremony were Gail’s father, well known Guyanese journalist Ralph Seeram, and local contact Gregory Rambarran. They both admonished the school’s authorities to take good care of the facilities and equipment and make sure that it is put to good use. The playground and Therapy Room were blessed by Pastor Williams. 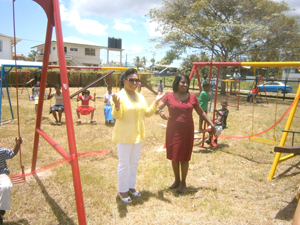 The playground is the third playground and the third Therapy Room to be handed over by the GAIL Foundation in Guyana.